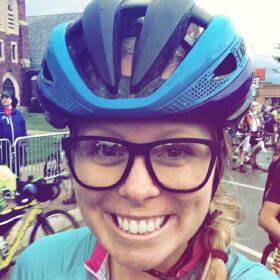 Angela is not only the Sales Manager at CycleX Bike Shop in Missouri, she's a certified bicycle fit technician and the winner of a prestigious scholarship to earn her bicycle mechanic certification. She also single-handedly built the women's cycling community in her town by organizing rides and mentoring growing athletes. We are fortunate to have Angela guiding tours for us in her off season because when she's not working, she's training for endurance gravel grinder races. If you don't know what they are, be sure to ask her. She'll have you joining her in no time! "Angela was an expert mechanic getting my fit on the bike tweeted just right and training me on the ebike so I had no issues with this transition." "Angela was very good. She did very well accommodating all of our dietary requests. She has a very easy, relaxed attitude which makes her very approachable."